I was just informed that the link to the "suggest a word" form is no longer supported. With wwf2 they took away the ability to suggest a new word in the app. So now the only way to submit a new word is through facebook and twitter. People like me who don't have facebook or twitter are up the proverbial creek. So much for me hoping for more transparency! This is a step in the WRONG direction!! Apologies for the inconvenience. I have responded to your private message regarding this and I understand how the Suggest A Word form helped you in terms of submitting words that should be added in the game. As the new process is yet to be implemented, you can continue posting your suggestions on this Forum page. @Sofia Allianah With all due respect, I'm sorry but I still do not understand. My point is I think it would be a little more effective to post the info here in the forum about the change regarding "how to submit a new word" rather than deleting my posts, sending me a PM about the changes, and sanctioning my profile as if I had done something wrong. Which by the way is still not fully operational. Please see your PM for more details. Thank you. how about "henge"--that's been a word for a long time. Stevia is a real word that was disallowed in my game today. It's a common word, a plant used for sweetening foods. The whole "suggest a word" concept makes no sense whatsoever. There are many perfectly fine complete and agreed internationally recognised word lists. Just choose one. If you are worried about offending somebody with a word that under some circumstances may be used in a derogatory sense let people choose the inoffensive dictionary as an alternative option. But then adults who play the game for its skill and ignore words and their meanings can enjoy the game to the full. Blocking a word because it might offend is a never-ending job. There are so many words that are included but might offend, eg POO*F is still allowed, when will they be quietly removed? What defines an "offensive" word? Even the terms "black" and "white" can offend some, will they soon be redacted? Henge needs to be added to your dictionary. Please add ‘jarble’ as a valid word. It’s in Webster’s, variety of valid word lists, etc. Opponent played word "sidearm" and I tried to make it plural by adding an "s", but your dictionary does not recognize this word. Why not? There is more than one definition to sidearm and one has a plural. Just had 3 words refused this morning which are all in the dictionary. 'Babysit' as in "I regularly babysit for my neighbour" ... 'Princely' as in "it was a princely amount" and 'Bitchy' as in "that was a bitchy remark" ... So infuriating! @Cher26 Lamaze is named for the French Doctor who developed it and is always capitalized. How can you not allow **** (smoke, cigar, cigarette) or BITCHY? **** is allowed but not BITCHY? I think Sativa and Grito should be added. Why does the word "je" work sometimes but not others. I have played it in one game and then in the next play on another game it does not allow it. I don't understand this. Either it's a good word or it isn't. @mdcaruso There are two different English dictionaries used by this game. "Je" is allowed in UK English but not in US English. Look for a little flag at the top of the game which indicates which dictionary that game is using. 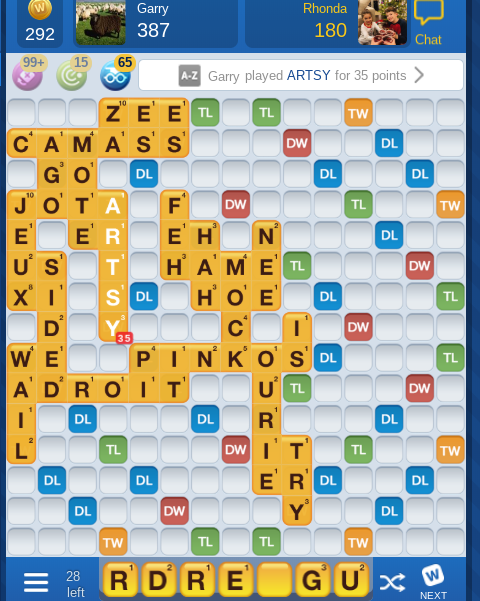 Word with friends should provide the definition of the word entered. It is not only a fun game but also a great way to help people expand their vocabulary. I hope to see this feature someday! Thank you.